NASA astronaut Douglas Wheelock (bottom, on robotic arm) removes a faulty ammonia pump on the International Space Station during a Wednesday, Aug. 11, 2010 spacewalk with crewmate Tracy Caldwell Dyson. Thisstory was updated at 6:31 p.m. ET. Twospacewalking astronauts finally removed a faulty pump outside the InternationalSpace Station Wednesday after overcoming a stubborn ammonia hose during their secondattempt in less than a week to repair the outpost's cooling system. Itcame down to brute strength in the end for NASA astronauts Douglas Wheelock andTracy Caldwell Dyson to remove the balky ammonia hose, which had stuck fast andleaked toxic ammonia coolant during an earlierspacewalk. Wheelockhad to shake a hose connector hard to pry it free from the broken pump that hishelmet camera showed him swaying from side-to-side. But ultimately hedisconnected the hose to the delight of the astronauts and Mission Control. Hesaw only a few flakes of ammonia while detaching the pump's final fluid hoseWednesday, far less than the snowstorm of frozen ammonia he reported seeingduring the Saturday spacewalk. Theastronauts parked the broken pump at a storage point outside the space stationafter removing it. NASA plans one more spacewalk,currently scheduled for no earlier than Monday, to complete the ammonia pumprepair. "Westill have a little ways to go, but today was a great day," Wheelockradioed Mission Control after the spacewalk, which lasted seven hours and 26minutes. TheInternationalSpace Station uses liquid ammonia to cool its onboard systems bytransporting waste heat to a network of radiators mounted to its main truss.Spacewalking astronauts take care to avoid exposure to ammonia (which freezesinto flakes when it leaks) while working outside and have lengthydecontamination protocols to clean their spacesuits when they do see leaks inorder to avoid bringing the toxic chemical inside. Thefaulty ammoniapump failed July 31, forcing astronauts to turn off some experiments andsystems, as well as leave others without backups, in order to prevent thestation from overheating. An internal electrical short tripped a circuitbreaker to cause the malfunction, station managers have said. NASA station managers have said the ammonia pump failure is one ofthe most challenging repairs for the International Space Station. Engineersinitially planned two spacewalks to replace the pump, but unexpected challengeson Saturday forced the addition of a third spacewalk. Part of the difficulty lies in the sheer bulk of the pumps. Each pump weighs 780pounds (353 kg) and is 5 1/2 feet long (1.6 meters) by 4 feet wide (1.2meters). They are about 3 feet (almost 1 meter) tall. So the spacewalkers hadto work together to move the bulky pump. CaldwellDyson, who helped her electrician father work while growing up, ?disconnectedthe pumps's five power and data cables. They gave her little trouble. "Mydad would be proud," she added. "I'mjust going to hold it as steady as I can," Wheelock told Caldwell Dyson ashe grasped the pump from the tip of the station's robotic arm. Stationastronaut Shannon Walker flew the arm for Wheelock from inside the station. Thefailed ammonia pump is located on the station's right side truss and will bereplaced with one of four spare pumps stored at the orbiting lab. The sparepump that will replace it was arrived at the station in 2007. But Wednesday's spacewalk appeared to go as planned, unlike thefirst repair attempt. Wheelockand Caldwell Dyson expected to have close two valves in hoses upstream of thepump and vent any remaining ammonia coolant overboard before removing the stuckammonia hose, which was the last of four connected to the disabled pump. Butthat wasn't needed, Mission Control said. Thereare two main coolingsystem loops ? Loop A and Loop B. The failed pump is in Loop A, while theother cooling loop remains operational. It was delivered to the space stationin 2002, but wasn't activated until 2006. Whilethe space station is currently stable, the U.S. segment is running with justhalf of its cooling system working until the new pump can be installed. If theworking cooling loop fails, astronauts would have only a short time to finishthe repairs, mission managers have said. Thespace station's Russian segment has its own independent cooling system, butcould only support the outpost's full six-person crew on its own for a few daysbefore station managers would have to consider last-minute repairs orabandoning the station. Wheelockand Caldwell Tyson didn't plan on completing their space station repairs duringWednesday's spacewalk. That comes on Monday, when the astronauts will perform athird spacewalk to retrieve a spare pump from a storage platform and install itin the old pump's place, station officials have said. Wednesday'sspacewalk began at 8:27 a.m. EDT (1227 GMT) and the astronauts wereconsistently ahead of schedule. "Wow,that's nice and bright," Caldwell Dyson responded. WhileWednesday's spacewalk was long, it fell short of the record-setting spacewalkby Wheelock and Caldwell Dyson on Saturday. That spacewalk lasted eight hoursand three minutes, making it the longest spacewalk ever performed from thespace station. Wednesday'sspacewalk was the fifth for Wheelock and the second for Caldwell Dyson. It wasthe 149th dedicated to space station assembly and maintenance. Constructionbegan on the $100 billion space station in 1998. Spareparts are a key concern for the International Space Station, which is now slatedto keep flying through at least 2020. After next year, no NASA space shuttleswill be flying to the space station to deliver large spare parts or supplies. NASAplans to fly two more shuttle missions (in November and February 2011) beforeretiring its orbiter fleet for good next year. NASA would need approval fromCongress and the White House to fly a potential third shuttle mission, whichwould launch next summer if approved. Last week, the Senate passed a NASAauthorization bill that would approve that extra shuttle flight, though theHouse vote on its version of the bill is still pending. NASAwill broadcast the next International Space Station spacewalk repair on NASA TV no earlier thanMonday, Aug. 16. 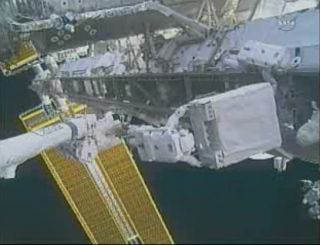 Click herefor space station mission updates and SPACE.com's NASA TV feed.